How cute is this Leona Layered Cami from Tobi.com?! I love to have a few solid tops in pretty shapes in my wardrobe because they go with everything. Basic tops like this one pair well with skirts, pants, and shorts, solid or patterned. Another great thing about a fancy cami is that it can be worn all year round; bear your arms during the summer and then add a cardigan when it starts to get cold out to keep warm. Tobi.com has everything you need to style this top all year round. The look I've styled here is perfect for a meal out with friends, a party, girls night out, and more! I'm really big on neutrals so I love the color of this top, which is 'Toast.' The next time I wear it I'm thinking I'm going to pair with with white jeans or a light colored skirt to create a completely neutral look. There are so many different pieces I can pair with this top and will be wearing it all summer long! Before you go today is the last day to enter my Blogiversary Giveaway! Good luck! Today I'm linking up with Tutu Tuesdays, and Confident Twosday, and Style Sessions. Very pretty top. It will definitely make a great neutral look with white. I love blush and black together. But blush and white is equally awesome! I look forward to how you style this adorable top with white. Really pretty outfit! Loving this top! So perfect for summer! Oh i love finding new link ups! Plus, your top is adorable. Love the top for the summer! That color pink is so pretty on you! This top is so pretty! I love the blush!! Such a pretty blush top! Thanks for hosting the linkup and hope you can stop by my Wednesday Linkup as well. That is a pretty blouse, I love the color of it! I love your outfit! So chic and fun but summer perfect! Great post! 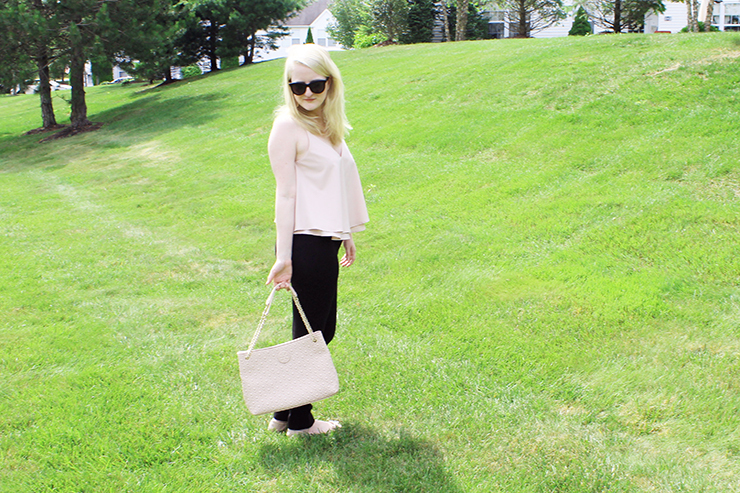 That blush colored top looks so beautiful on you, we love your whole outfit!